Manhattan’s East Village is known for its hip, young crowd. 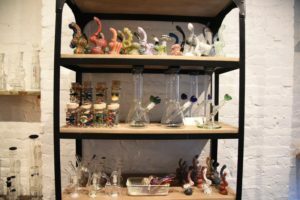 Along with bars, restaurants and boutiques, this New York neighborhood is home to Village Grannies, a one-of-a-kind smoke shop, founded by Zvia Eldar and Vered Behr – “could be grannies” who are young at heart. “Beautiful environment, beautiful products, and amazing prices.” That’s how Eldar and Behr describe this artsy space. 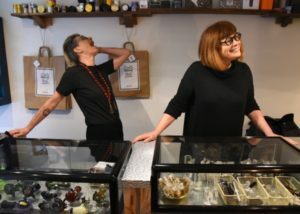 Jewelry designer Behr, and Eldar, a creative director, working on films, commercials, and branding, combined their artistic sensibilities in creating a lifestyle store where customers can interact with the merchandise whereas in many smoke shops it is locked away in a showcase or out of reach on a shelf behind the counter. 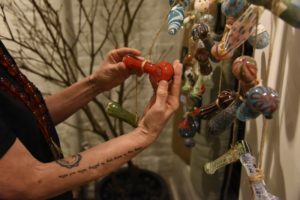 Village Grannies, which more resembles a Pottery Barn than a hippie hangout, is decorated with funky art, a gold-painted wall that reads “Life is Beautiful,” and a blue sofa accented with hand-stitched pillows bearing cannabis leaves. 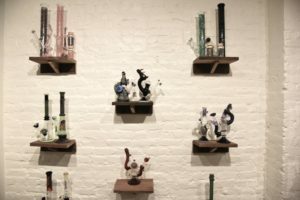 There’s a warm, welcoming vibe, and many of the glass pieces are displayed on reclaimed wood shelves – some larger water pipes are simply lined up along the wall on the hardwood floor. The rationale is that glass is more appealing displayed on wood than when placed on a glass shelf because the wood brings out the colors of the piece. Lighting also plays an important part — rather than blanketing the space with harsh fluorescents, track lighting and pendants soften the ambiance and draw focus to the products. “It shows the quality better and gives the products the respect they deserve,” Eldar explains. Every piece of glass is hand-selected by the grannies at trade shows and from independent artists. They look for three elements — design, quality and affordability. When it comes to customer service, the Grannies approach is “anybody” can be a customer. “The image that some people have about consumers for smoking accessories is far from the truth,” Behr says.